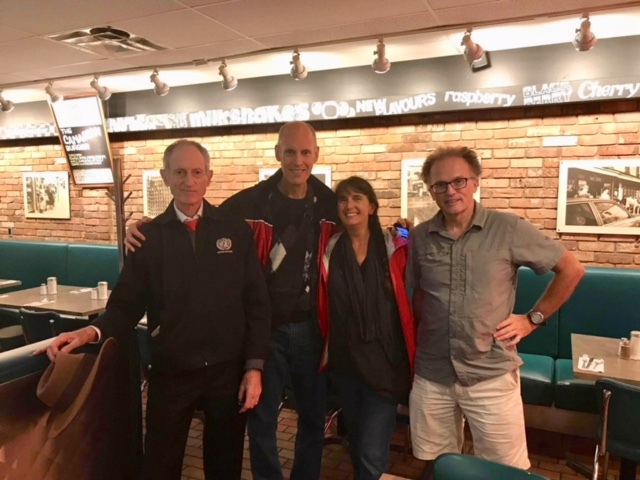 We hosted and organized a Scientists’ Warning presentation for Stuart Scott in Ottawa, Canada, on Thursday, September 20th, 2018. We hope that sharing our experience will be helpful to others who are planning presentations. Ironically, the day following the talk, the region experienced unusual weather patterns, which were likely induced by climate change. We discussed the idea with Stuart after becoming aware of his travel itinerary for the fall of 2018. Stuart was receptive to the idea as he would be travelling to the northeastern U.S. We quickly converged on a date. This discussion occurred roughly around August 28, 2018, about three and a half weeks prior to the presentation. The next step was to book a room. This proved to be quite challenging as we didn’t have a lot of lead time and Stuart aspired to have a room that could hold 200 people. There were several factors to keep in mind, such as room capacity, location, parking and public transit. After doing some research, we came upon some openings that were relatively expensive ($400-$800 CAD). We continued our search hoping to find something more reasonably priced. By chance we found an opening at the Sandy Hill Community Centre for $150 CAD. The room was relatively spacious with a capacity of 140 people. It was also centrally located, provided ample parking, and was accessible by bus. Stuart has since reimbursed us for the room rental using PayPal. After paying for the room rental in advance and obtaining a receipt, Stuart went ahead and booked his flights to and from Ottawa. We agreed that Stuart would stay with us at our home in Kanata and he was quite happy to sleep in our carpeted living room using a memory foam camping mat, that we supplied, along with his sleeping bag. We could now proceed with promoting the event and Stuart promptly sent us a flyer. We decided to use an event planning app called EventBrite. EventBrite allows one to insert an image that shows up in event listings. The image requirements were for a 2:1 aspect ratio. In order to get something up in a timely manner, we simply saved the pdf file as a jpeg and then used a photo editor to crop a portion of the flyer with a near 2:1 image aspect ratio. Later, as the event date neared, we decided to use a tool called “Google Slides” which allows one to edit slides, similar to MS Powerpoint, and setup with a custom aspect ratio. Since the Scientists’ Warning website has a very nice logo, we decided to use it as the primary graphic for our listing in EventBrite. We also sent invitations to a number of personal contacts. Although the number of ticket reservations was somewhat anemic at the beginning, most of the growth in ticket reservations occurred 7 to 14 days prior to the event and reached an apex of 44 reservations. We also had to keep in mind that there were a number of events going on during the same week due to the upcoming municipal elections. In addition, we were able to set up an automatic email using EventBrite that would go out to ticket holders two days before the presentation to remind them of the upcoming event. The other considerations for the event were arranging to provide a sound system as well as recording the event. Because of our experience as musicians, we had these two items easily covered. We were able to use our PA system along with two microphones, one for Stuart and one for audience questions. We set up a static video camera to record the entire event along with a hand-held camera to occasionally rove around the room providing different perspectives. To ensure good audio, a recording device was connected to the “Record Line Out” of the PA system. We also needed to have an LCD projector with an HDMI port. Fortunately, we were able to borrow one from a friend as these can be prohibitively expensive to rent. The day before the presentation was busy! We did some grocery shopping and got the house ready, as we would be hosting Stuart for two nights. We also kept track of ticket reservations and also contacted individuals who had already reserved a ticket and reminded them that they could bring a friend. We also re-posted the event on Twitter and Facebook. We were in contact with Paul Beckwith, as we knew that he would want to spend some time with Stuart during his short stay in Ottawa. Stuart’s flight was scheduled to arrive in Ottawa at 11:19 pm, so we left the house in plenty of time to get to the airport. We were tracking his flight from New York and noticed that it was early. 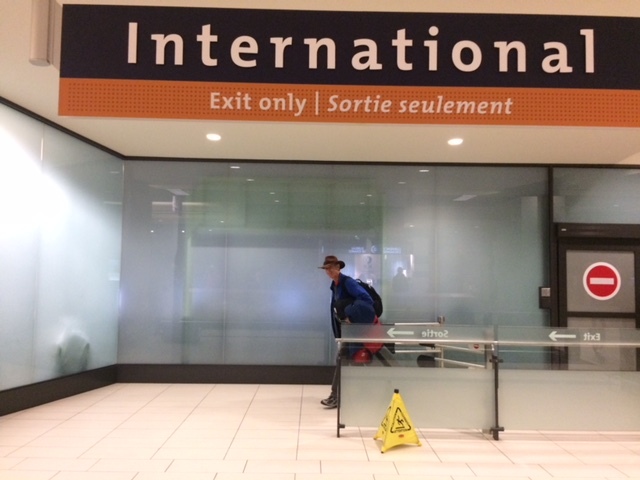 After a short wait, he came through the “International” exit with his big suitcase and backpack. He enjoyed the ride back to our place in our electric car (Nissan Leaf). After breakfast, we confirmed with Paul Beckwith that he would be joining Stuart and us for lunch at our place. This gave us an opportunity to get to know Paul, which was great. Stuart was eager to fine tune his presentation for a Canadian audience and got to work right away. Charles had to test the projector and Heidi was keeping track of last-minute ticket reservations. We had unanimously decided that it would be best to go for an early dinner. We drove to The Green Door restaurant where we all thoroughly enjoyed a buffet-style, organic, vegan/vegetarian meal. From there, we drove to the Sandy Hill Community Centre, where the presentation was to take place. We arrived about an hour before the presentation in order to give ourselves plenty of time to set up chairs, a couple of tables, the microphones, laptop, PA, projector and camera. Unfortunately, there was a very loud noise coming from the vent and a technician had to be called to resolve the issue, but it did get resolved in plenty of time. Heidi was the official greeter and attendees started arriving about ten minutes prior to the presentation. Most of them arrived at the beginning of the talk, which made it a little bit difficult to keep track and to greet everyone. As expected, there were a few no-shows, but there were also a few people who had been invited, but hadn’t reserved, and we were delighted to see them. Charles, Paul and Stuart focused on making sure the sound system and projector were ready. Charles introduced Paul Beckwith, a climate system scientist and professor, who has a website and Youtube channel with many pedagogical videos on climate change and its key drivers. Paul introduced Stuart by explaining how they had met. Stuart gave a powerful 50-minute talk. As the slide projector we had borrowed was an older model with a lower light output, it was necessary to dim the lights to make sure that the audience members could see the slides; unfortunately, this meant that Stuart was not well lit for the video recording; however, the lights were turned back up during the Q&A portion of the evening. The audience was mainly comprised of people who were already aware of climate change, and a few were most likely already aware of abrupt climate change and the urgency of its consequences. Most of the attendees stayed for the Q&A session, which was thought-provoking and sparked much discussion. In the end, we didn’t have much time to put everything away, but we managed and were very pleased that the event had gone well. After the presentation, the four of us went out for a snack and some well-deserved leisure time at a local diner. From left to right: Stuart, Charles, Heidi and Paul. After breakfast, Stuart played the piano for us for a few minutes – a lovely piece that he had composed. We then drove him to the airport. After two nights in Ottawa, Stuart was off to Boston to visit one of his sons and would have the opportunity to meet with Rob Moir, one of our core team members. From Boston, Stuart would then be travelling to Washington, D.C. In the afternoon Heidi and I drove out to Almonte, a town west of Ottawa, to return the projector to our friend who had kindly loaned it to us. We had a nice visit and just as we were preparing to head back to our home in Kanata (a suburb west of Ottawa) we received some alerts from Environment Canada on our cellphones warning of a potential tornado and to take immediate cover. So we extended our visit for another half hour after which we decided we should start heading back home. On our way home we encountered a few heavy wind gusts on Hwy 417 and we received at least one additional alert in addition to the possibility of hail. We observed the skies looked dark and gray to the north of us (i.e. Dunrobin area). Once home we were very thankful to be safely home with our car in the garage. We turned the local TV news on and started hearing the reports of the tornado damage in Dunrobin (4:50 pm), Gatineau, QC (5:10 pm), and then later in Arlington Woods (6:00 pm) in the Nepean area. Shortly after 6:00 pm the power went out. It would remain out in our neighborhood for approximately 27 hours. We managed to find a few candles and a small LED flashlight, which proved very helpful. Having not had supper we made a few sandwiches. I had an older 12V battery/inverter unit that unfortunately hadn’t been left on charge for awhile and used it to keep our modem going. We went for a walk outside and ended up having to quickly return due to a sudden downpour. We went to sleep significantly earlier than our usual time (being in darkness has a way encouraging this). The following day we noticed that although the power was still out in our neighborhood, it had returned to small pockets of Kanata. We managed to take our electric car to a DC fast charger where we charged back up to 80%. At the charging station we met another car owner who had driven over from the downtown area to charge due to a power outage in his area. After this we went to a store to stock up on candles and bought a second LED flashlight. As we drove along we listened to a news conference with the mayor and the details of the devastation to narrow clusters of homes, many of them no longer habitable. The McDonalds and Tim Hortons restaurants had very long lineups and we decided not to wait – instead we took advantage of a vegan buffet at a local Farmboy grocery store in Stittsville, just west of Kanata. We noticed that the traffic was unusually heavy for a Saturday morning – a lot of people were out looking for restaurants, grocery stores and stores that were open. We heard on the news that a lot of gas stations were closed – another reason for the higher-than-normal volume of traffic as people were looking for gas stations. Later that afternoon a friend loaned us a generator, which we ran for a while to run our fridge, charge our phones, and 12V battery/inverter unit. A neighbour walked over and warned us not to leave the generator unattended since it could easily disappear. Some nice friends from our refugee sponsorship group invited us for supper (their power had come back on in the middle of the night). We spent a delightful evening with them and were glad to return home late that evening to discover the power was back on. This experience sensitized us to becoming better prepared for an emergency. Over the next few days, Environment Canada reported that there had actually been six tornadoes. Three of these tornadoes had caused extensive damage in the Ottawa area, with the first tornado touching down in Calabogie, the second in Dunrobin prior to skipping across the Ottawa River to Gatineau, Quebec, and the third touching down in two areas in west Ottawa. Tornadoes four, five and six hit Val-des-bois, Otter Lake and the Baskatong reservoir, all in western Quebec. Paul Beckwith put together three interesting videos about the Ottawa area tornados (see the following links: Video-1, Video-2 and Video-3). It was interesting that the extreme weather that we experienced had occurred the day after Stuart’s Scientists’ Warning presentation.